Use this coupon code to save $10 on your college based scholarship search from Collegetreasure.com. Create a free online profile and start searching for scholarships today at Collegetreasure.com. Act now to search through thousands at Collegetreasure.com for free. 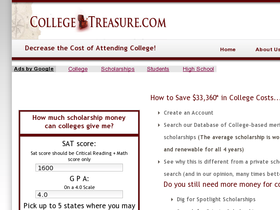 Enjoy full access to school and scholarship searches at Collegetreasure.com with a membership for only $85.